Coldest July in history for Anchorage? | Watts Up With That? Could this be the coldest July in history for Anchorage? According to the National Weather Service, Anchorage, Alaska is experiencing record cold temperatures this month. Usually July is Anchorage’s hottest month, but it’s been warmer the last few days in Barrow, 800 miles to the north on Alaska’s Arctic coast, than it has been in the state’s largest city. Who’s colder today: Anchorage or Barrow, Alaska? By Alaska’s summer standards, it’s been cool in South-Central Alaska this month and especially this week. (By lower 48 standards, it’s flat out cold). 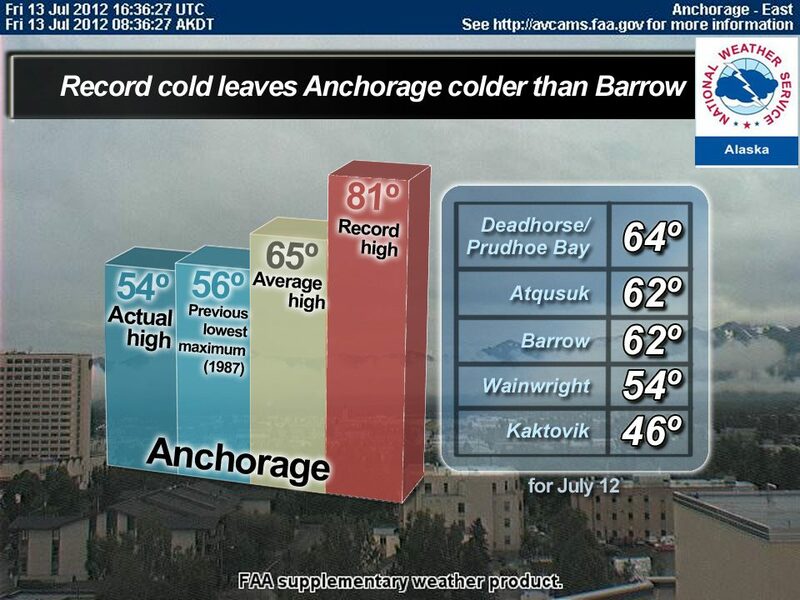 It’s been so cool in Anchorage that for the past two days (July 11 and 12) high temperatures have been colder than Barrow, the 9th northermost city in the world, which is more than 700 miles to the north of Alaska’s largest city. Moreover, July is normally the warmest month of the year on average in Anchorage. This July is the coldest on record (so far) by more than 1.5º with an average monthly temperature of 52.7º. The coolest July on record occurred in 1920 with an average monthly temperature of 54.4º. Indeed, we experienced snow and sleet right up to June 5th this year and the snow in the 3500′ – 6000′ range is quite delinquent along the Chugach, Alaska Range and the Wrangell mountains. Folks do not remember so much snow on the mountains this late in the year and since the mid-range snowpack is now heading for a second year without melting, we’ll be seeing glacier growth coming along quite nicely. Also, the northern hemisphere permafrost is in it’s 5th year of growth, with the depth and temperature profiles looking more and more like a coming glacial period. I thought they said this about LAST year’s temps, too. It’s been a few chilly summers here for a while. Yesterday in Wasilla, it was 54.
there is nothing new under the sun. what has come before will come again, we are in the 50s now in the period of a pdo flip to cold and though not exactly the same, similar results can be affected. It’s weather. Nothing to see here. Why? Because they say so. Not enough asphalt tarmac at Anchorage International Airport. If they expand the tarmac, I’m sure they’ll be as warm as Miami in no time. I take it Mr. Gore is informing us Mr. Watts is not reporting enough on record cold temperatures. We should oblige him. Just proves what lots of your guest bloggers and commenters have been telling us. We’re heading for another ice age. None of this global warming nonsense in that part of Alaska this month. To be confirmed when the ratio of record highs to record lows around the world drops below one. I think it’s been on average one record low to two record highs for the past few years, but it’s bound to flip the other way any day now. Not helped by continental USA this year (we can ignore that, it’s just weather), but the UK has been a bit cool and wet the past month or so (that’s more proof that global warming is about to reverse). This is a testament to just how cold the North Pacific Cold Pool is. To be honest, even down here in the upper 30s N, and even though the ENSO meter says “El Nino” there is absolutely no hint of El Nino. We get the odd warm day but in general we continue to run normal to colder than normal. On and on it drones. The Kenai has seldom been above 52, and some highs have been in the 40’s since mid May. There were a few days over 70 back in June. Mostly overcast and very cool. And there is no airport or UHI within 20 miles of me. The King salmon (Chinook) is the lowest ever recorded. Last year the greeting was Happy Juneuary, and it is cooler this year. But you don’t understand. It’s different this time. We just need more government to solve our problems. “Fairness” will push back the glaciers. Barrow webcam still showing a lot of sea ice with local air temp at 41F. No doubt the ice will be fine then. Another sign of runaway global warming. Or as Gore would say “Runway Global Warming”. I try not to weigh in on any debate about how the ice is feeling. Just proves what lots of your guest bloggers and commenters have been telling us. We’re heading for another ice age. Have I been reading some other set of guest bloggers and commenters? I thought from all the reading that Earth is in an ice age. No? Some say within this ice age there have been interglacial periods – even saying Earth is currently in such a thing. And a name: Holocene or, perhaps, MIS 1. Within this, they say, there are cool periods (see little ice age) and warm periods (see medieval warm period), and transitions. Note in the graphic there was a “previous lowest maximum” in 1987 that was just 2 degrees higher than the current observation. If either of these events “proves” anything – what that is escapes me. We were told that the UK was to expect a drier than normal spring. What we got was lots of rain. Now the Guardian et al are trying to explain how global warming climate change could explain the cold wet summer so far. By the way is the UK drought (caused by global warming) over yet? You can’t win against any religion. Mr. Bastardi’s comment caught my eye. I’ve lived mostly on the NSW coastal strip and I have strong memories of the period from the fifties to the seventies. In spite of some very high heat around 1960, with drought and bushfire, my first decades were spent in a moist climate. The climate recalled by my parents and grandparents from their youths was very different. Australia had its own version of America’s dustbowl thirties, and, after the wet 1890s, we were in overall rainfall deficit till around the year of my birth, 1949. However, for much of my life, temperate eastern Oz was a pretty humid place dominated by oceanic winds. That all changed in the early eighties, and, despite some floods and sharp winters, inland westerly winds were dominant, and thunderstorms in winter did not happen. Drought and fire held sway. In 2007, there was an unmistakable change, and oceanic winds began to dominate again. The El Nino of ’09 had a completely different complexion to those of previous decades, we now get thunder every winter – even in droughty August – and the weather resembles more and more that of my childhood in the fifties. Yet this enormity is only lightly discussed. The constant moisture has been all around us for five years in my region, the change of dominant wind patterns is blatant, unmissable. This climatic shift is not the elephant in the room; it’s the elephant herd in the phone booth – yet it simply does not rate with our data-torturing climate experts. I know not to see complex things in terms of simple mechanisms – I leave that to our Green Betters – but isn’t it time for a lot more talk about PDO? Like, a LOT more talk about it? Anyway, Mr. Bastardi, you definitely have my attention. The King salmon (Chinook) is the lowest ever recorded. See PDO. One phase (the current one) seems to coincide with increased runs from Oregon north to southern B.C. and decreases in Alaskan rivers. The other phase produces opposite results. Recent news articles chronicle this phenomenon. If you can explain why you can win a prize. Don’t worry, Anchorage’s missing heat must be hiding in the pipeline. Request money to take readings there. Sounds like what Piers Corbyn was warning us about a couple of weeks ago! It should be a fun Olympic Games in London if this lot holds up. This is an ‘interesting’ summer indeed. I mean nobody will buy the AGW crap anymore. They need another guilt trip idea FAST!! Jeez, you’ve broken my dream. Last night I was dreaming it was so cold this July that snow had fallen again… crops could not grow … well the weather here in the UK has been solid rain, rain, rain, and more rain for weeks. … but will anyone ever ‘fess up to have been taken for a ride, or to have shouted without checking the science?? Oficially finished last week. We can water our flooded gardens with hosepipes now! There was a frost in Scotland last week! Yes, this Wildfowl & Wetland Trust site (see link below) is 10 miles up the road from me on the west cost of Wales (west coast of the UK). They are reporting migratory birds arrival in numbers now in July that would normally not be seen here for another several weeks. “Interesting” times ahead I think…. Is there a wee bit of translation software out there that auto converts deg C to deg F ? As non scientists and non proffesionals us skeptics could baffle all the technical people in Europe and elsewhere around the world by using a wierd temperature interval to describe events. Jimbo – the drought was officially declared over when all the remaining water authorities lifted their hosepipe bans on 9th July. The Environment Agency has said that, short of a long, prolionged hot and dry spell for the remainder of the summer, the risk of drought returning is small. We have restored groundwater levels in the summer, which is apparently very unusual, save in some areas of sandstone which traditionally take much longer to replenish after rainfall, river levels are high and reservoirs mostly full. Our 12 month rainfall levels are around average, although the past 3 months have been 250% of average. We are officially back to normal and would appreciate some dry and sunny weather in August and September. Dont worry we can grow tomatos faster with this equipment. My prediction is this: sea ice around Alaska will remain high in years to come courtesy of the PDO going negative. Sea Ice around Svalbard, Western Greenland and the Northwest of Russia will remain low until 2020, when the AMO flipping will slowly see that start to increase. Sea ice minima will bumble along the bottom this decade and start to rise significantly in the 2020s, radically if SC25 is radically weaker than SC24 as some predict. Glaciers will continue to advance in Alaska. Rising CO2 levels will help equatorial forests to regrow slowly which will be either aided or prevented by the policies of ranchers, governments and corporations. Rainfall will continue to increase in the southern Sahel. Governments will start to consider which regions of the earth are best suited to making up any shortfalls in staple crop harvests in Canada, the Northern USA, Ukraine, Russia etc. They will be monitoring the northern extremities of the Sahara, parts of the Southern USA and Mid-West etc etc and planning for migrations southward as high latitude climates become temporarily inconsistent with sustainable agriculture. The world will not end, but humanity will have to adapt. It might be a good idea to think about how to do that rather than having intellectual wanking competitions about ‘climate change’. I might have to disagree a little bit with Mr.Bastardi, I think, despite the cold PDO, the next 5-7 years and their corresponding winters will still be relatively cold, at least colder than what we have experienced the last 15-20 years in warmer PDO. However, if he’s comparing the next 5-7 years to the decades that follow, I certainly agree, especially considering that we get both the PDO and AMO to cool and the solar cycles to plummet to levels similar to the Dalton and perhaps the Maunder minimum, could get very interesting. I’m fairly confident though, that we won’t see any significant warming over this time, because the large scale climate factors are pointing towards a cooling, and it has absolutely nothing to do with CO2. Here in Germany, Central Europe, temps are 10 degrees Centigrade below average for this time of the year for the third week in a row and it’s raining cats and dogs all the time, occasionally interrupted by short, but strong thunderstorms, only. The Puget Sound region has been a solid 3F below normal all spring and into the summer. We were under a cold gray trough basically the entire month of June. Our glaciers will advance for the second year in a row. They advanced last year due to a ridiculously cold spring. Artist’s Point at Mt. Baker, a big parking lot with a big view, never opened last year due to snow. This year the glaciers will continue their advance due to very high snowfall and low insolation during the longest days. We are told, here in the UK, that our current unsummer weather is due to the southerly position of the jet stream. Would this be the case for other areas such as Alaska? And if so when the jet stream moves north will we be back to “global warming”? 62 in Barrow. Wow. Thats unreal. Current Arctic ice is a little paradoxical. Its thicker on the side near Greenland and east Canada where temperatures are record high, and apparently very thin on the North pacific side where temperatures are very low. With all the major climate datasets in the hands of AGW activists, I wonder if they will continue to report year-on-year Arctic ice decline until icebergs start showing up in Manhatten and the Thames estuary. Again in the real world. the tongue of cool water continues to extend off the Peruvian coast westward, south of the equator, such that the Nino index supposedly rising toward el Nino has just dipped. I still think that the ENSO nonlinear oscillator is finely balanced and could tip one way or the other, and that a triple-dip La Nina is still a strong possibility. We must keep in mind though all of this is very interesting. But keep in mind as one of the previous comments stressed “weather is not climate.” The fact that it is very cold in Alaska cannot be pointed to as proof of climate change in either direction. To do so is to be just as foolhardy as those saying the heat waves in much of the rest of North America is tied to global warming. And I agree the present cold phase of the PDO is likely involved in the cold Achorage temperatures. Rod Chilton. Welcome to the cold PDO get used to it……..God help us if solar cycle theories are correct. 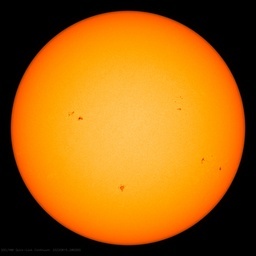 Mr. Bastardi, With the current cold cycle of the PDO and an inactive sun, we should be returning to the ave global temperatures of the 60’s and 70’s? And the arctic sea ice will return? And the NH snow cover anomaly will recover? And Greenland land ice will stop melting? And the ocean heat content will start decreasing? And the sea level rise will level out and then decrease? Good luck with that one. When I see the arctic sea ice recovering (as you predicted over a year ago), I will start putting faith in your predictions. This story was written BEFORE it went through the Mann-o-matic – the corrected version will be picked up worldwide. See, it all depends on your perspective. If all you’re expecting to see is hotter than normal, you’ll find it. Just pick the right cities. Not paradoxical at all, the gyre pushes ice to the Greenland and Northern Canada where piles up, that’s normal although it’s been greatly diminishing over the last several years. Although you linked to a report concerning Baffin Island, probably a couple of thousand miles away. So bad it’s blocking supply ships 2,000 miles away! Such deep sarc normally gets missed on blogs. BTW what global warming do you mean? Global temps have slightly cooled since 1998. But I guess they will shoot back up any day now. Its just a matter of waiting for el Ninot. Yet this enormity is only lightly discussed. It is well known by those who understand oceanography and climate (i.e. Bob Tisdale) that a major climate shift took place in 1976-1977, stemming from a shift in ENSO-related ocean behaviour in the Pacific. It may be that another such change occurred in 2007. When I lived in New Hampshire, the TV meteorologist frequently pointed out that when it is unusually cool in Alaska, it is almost always unusually warm in New Hampshire, and vice versa. The heat wave in the east and the cold weather in Alaska fit in with this observation. Cold now, warm tomorrow, and vice versa. Everything’s global warming/climate change, though. Washington DC heat, Anchorage cold, UK lousy summer, Balkan record heat… I’m happy to leave this one post and say that I won’t be reading any more weather stuff on here, nor any of the politics, just the science. One of the things we see up here is the notion that there is only so much cold air to go around, though it usually only happens in winter. When it is brutally cold up here, it is nice down south. When the cold drops south, it warms up nicely up here (Anchorage). Regarding the science, I’m reading lately about record hot days compared to cold over large data samples (all USA, globe), and over time. Obviously in a warming climate, there are going to be, statistically, more extreme hot events than cold, and this is what we are seeing in spades. I am definitely NOT reading that there was record heat in (x) city, therefore AGW – not from serious, scientific sources. Of course, weather extremes at a single location for a single (half) month tell you nothing about overall climate change. I suppose that kind of specious argument may appear in tabloids or similar. Then, what is the point of the top post? It’s nothing to do with climate or trends or scientific analysis. In the context of this blog, and judging by the majority of following comments, the implication is that a record cold day is a thumb in the eye to AGW. But it certainly isn’t, and there is an opportunity here for the hosts to disabuse followers of that notion. Is that perhaps significant for you? Do the maths excercise and see for yourself that we entered in a cooling phase since 1995. Obviously all the dr’s and and prof’s here making their livelyhoods out of AGW or ACC refuse to look at the maxima….there must be a reason? But how long do they think they can hide the truth and what will the final cost be to humanity, in terms of wasted crops in the areas that are cooling down faster than elsewhere? Have you tried enhancing the CO2 level in your greenhouse. You can get kits on line. That’s funny. You are funny. As long as you remember that the CO2 is added to greenhouses to stimulate growth, not to trap heat. Although, somehow I think the cooling that I observe happening there is probably not a laughing matter. July 15, 2012, central Kenai Peninsula, 11;30AM local time, temp is 44F with a brisk wind. Back during the warm 90s the birches near our place would start to turn in September and become bright with color in November. The following decade this shifted a month earlier. Thus far this decade, a month earlier yet. I wish I coulld give good news but my results from Alaska are frightening. If it gets too cold you have to pack up and leave.